This residential steam cleaning machine is the new Green way to clean. It is environmentally friendly, because it uses no chemicals to clean, just water. Go Green, use steam! It is great for bathroom use, including cleaning mirrors, countertop surfaces, and grouted tiles. The Vapamore Primo steam cleaner sanitizes and removes dirt, stains, mold, germs, spores, bacteria, and kills dust mites from all surfaces. Dirty grout, pet stains, greasy surfaces, and moldy walls are all areas that can be cleaned by this residential unit. It is also an effective tool in bedbug elimination. The Vapamore Primo is not a commercially rated machine, like some of our other steam cleaning machines. The stainless steel heating tank has a 1.6 liter capacity, and will achieve a maximum temperature of 220 degrees Fahrenheit. The tank typically requires 11 minutes to fully heat the water to steam, giving you approximately 60 minutes of cleaning time. 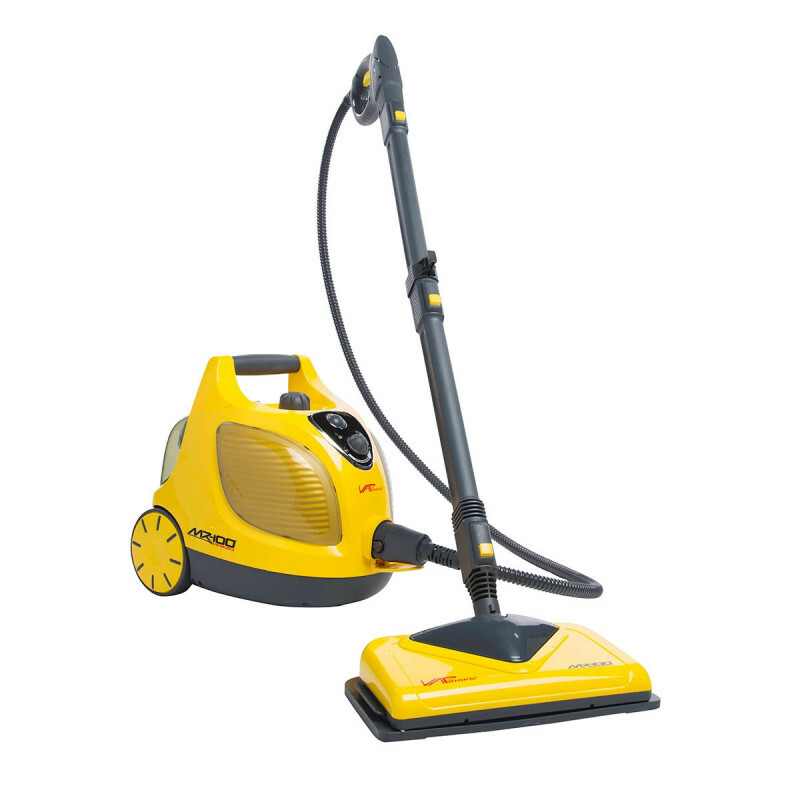 The attached tools and accessories are powerful enough for small area residential cleaning. Jet Nozzle Tool, Detail Scraper Tool, Nylon Grout Brush, Nylon Brush Medium, Nylon Brush Large, Brass Metal Brush, Clothes / Fabric Tool, Fabric Tool Cotton Cover, Floor Cleaning Head, Triangle Corner Brush, Extension Tubes X 2, Water Level Dipstick, Steam Gun and Hose, Carpet Slider, Micro Fiber Floor Pad, Detail Accessory Adapter, Smooth Surface Squeegee, Measuring Cup, Fill Funnel, Accessory Storage Bag, Replacement O-ring Set. Adjustable steam output with a 1500 watt heater delivers a maximum temperature of 220° F.
No purging required due to a solenoid that eliminates water and condensation build up in the steam hose. Hassle free retractable 18' power cord gives you plenty of movement to clean in different areas. Customers who were interested in the Vapamore Primo Residential Steam Cleaner were also interested in the following items. This is a review for the Vapamore Primo Residential Steam Cleaner.